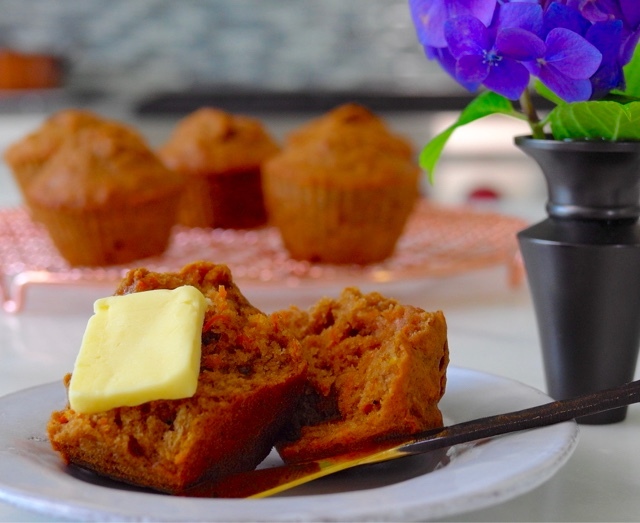 Would you like some muffin with your gratuitous slab of salted grassfed butter? The 10 yr old got braces a couple of days ago and is so grouchy that she can't eat her favourite foods. She's been complaining about her sore teeth and even decided to divvy up for her friends her salt water taffy and Hi-Chew collection that she recently purchased on our trip to Cannon Beach and Portland. I decided to make a little treat for after rhythmic gymnastics summer camp. She's there M-F for 5 hours each day for 3 weeks this summer and when she gets home she's hungry! 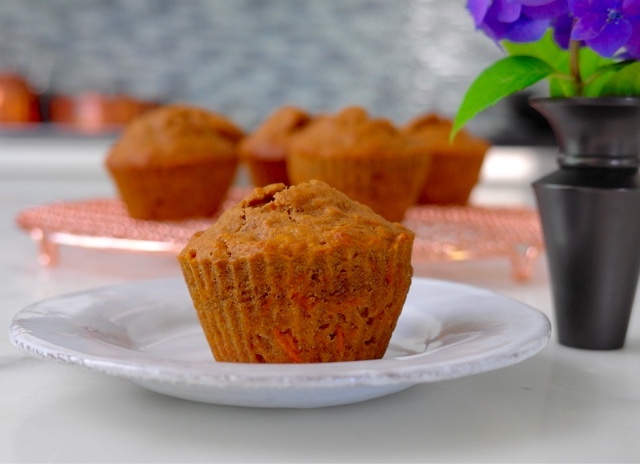 Chock full of healthy carrot and banana, I was able to also reduce the sugar by replacing with coconut palm sugar. 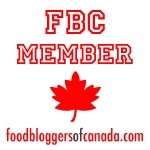 You might want to use maple syrup or honey instead. 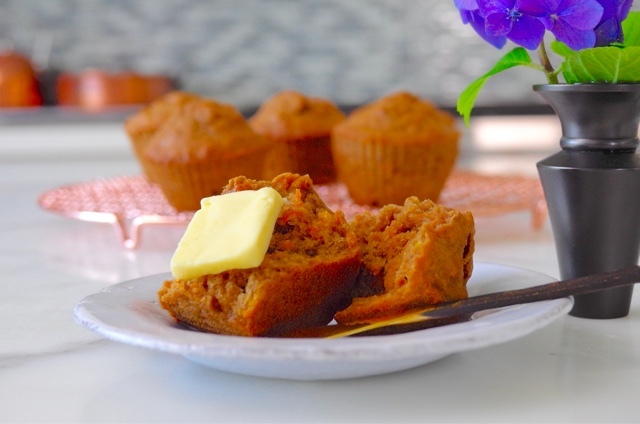 The muffins are moist and don't need frosting or butter...but what the heck--I'll stick a chunk of cold salted butter on top for the kid 'cause her metabolism can handle it. 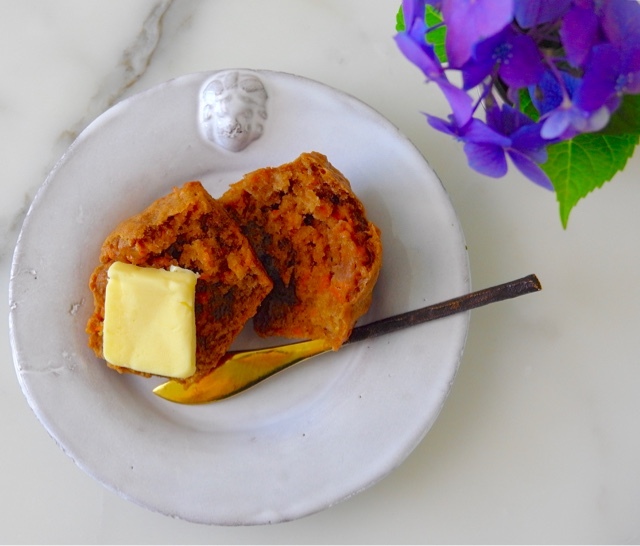 You know what happens when salted butter hits a hot muffin right? It looks amazing and it tastes so good. 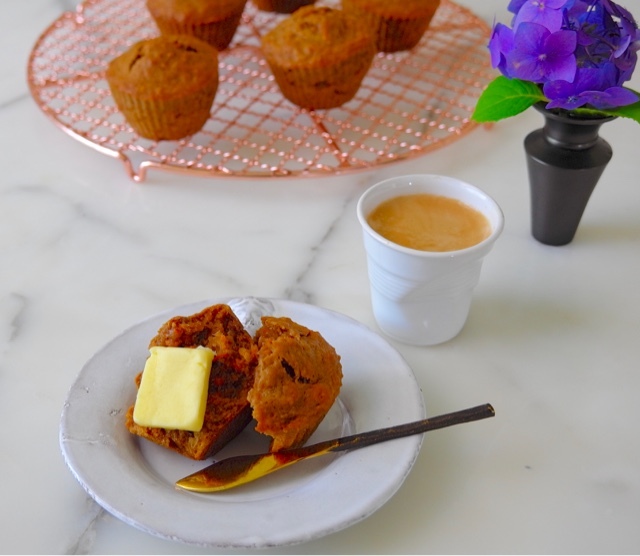 These Carrot Banana Muffins make a small batch because we don't have a lot of sweet tooths in our household (oh the irony.) They make a great snack for after school/sports or even a tasty breakfast with coffee or tea. and yes, the salted butter is one of those things that you have to do one of these days if you haven't already tried it. 2. Prepare the muffin tin by lining with paper liners or silicone molds. I used silicone muffin molds. 3. 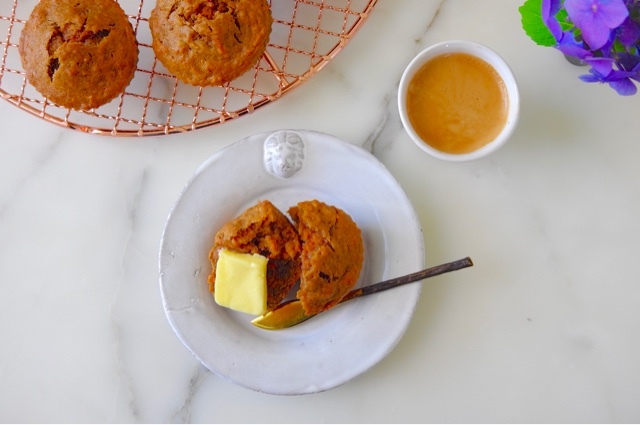 Using the Muffin-method, prepare your batter: In a bowl, combine the flour, soda, grated carrot and salt. In a separate bowl, combine the bananas, egg, coconut oil, coconut sugar and vanilla. Using a handheld immersion blender, blend all the wet ingredients. Alternatively, you can simply mash the banana by hand and mix the rest of the wet ingredients with it. 4. Make a well in the dry ingredients. Pour the wet ingredients in the well and combine gently until just mixed. At this point add optional chunky ingredients if desired. Don't overmix. 5. Fill your muffin cups 4/5 full with the batter.